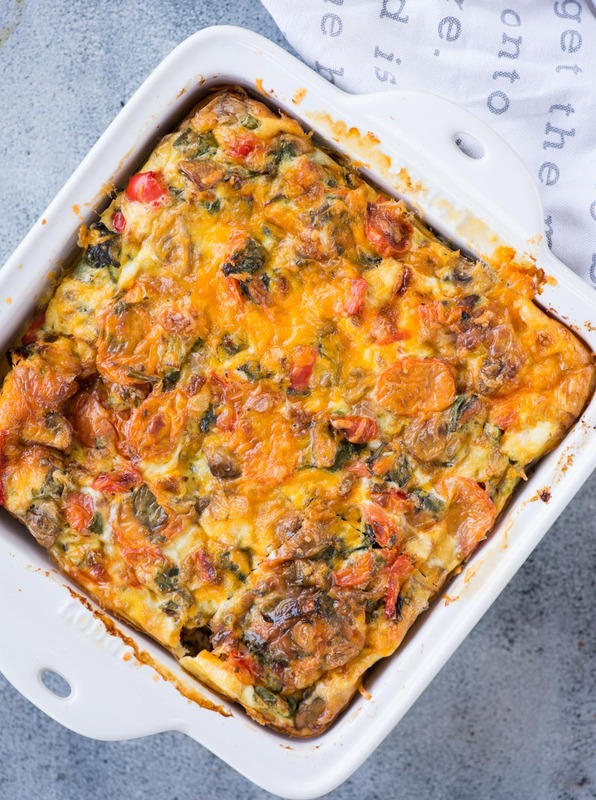 Easy breakfast casserole with eggs, bread, vegetables and topped with cheese. This Breakfast Casserole recipe can be made ahead and perfect to feed a big crowd. 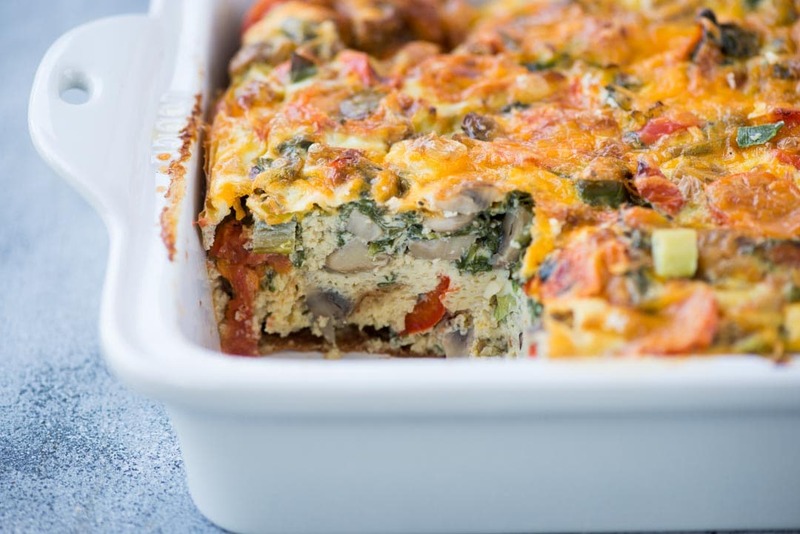 This amazing Breakfast Casserole made with bread, eggs, veggies and topped with cheese. It is hearty and filling. With minimum preparation, this easy breakfast casserole is a saviour on busy mornings. The best part is you can throw in all the ingredients the night before and the next day morning pop it to the oven. For us, breakfast is a must and we never skip it. A proper filling breakfast is the important meal of the day. But there are days I really want to sit with my legs up on the couch and sip a cup of tea, especially on the weekends. 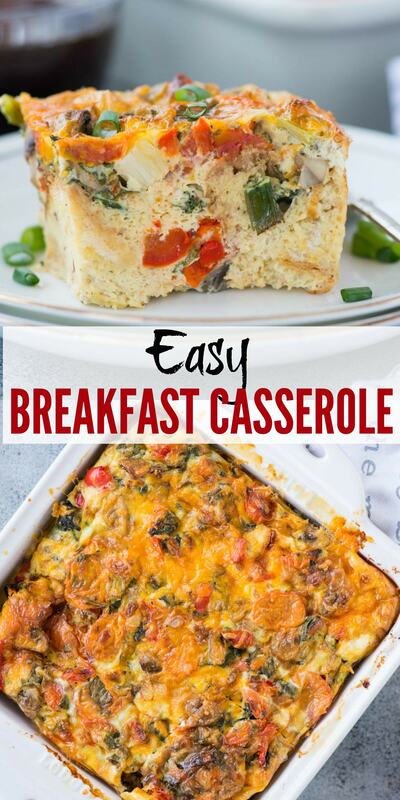 I usually make this easy Breakfast Casserole, which is really quick to put together. 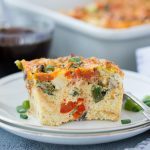 WHAT DO I LOVE ABOUT THIS MAKE-AHEAD BREAKFAST CASSEROLE? There are a number of things I love about this casserole. It is versatile, healthy, quick and easy to make. 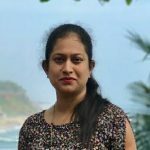 It is really easy and quick to prepare. The prep takes just about 10 minutes. First pre-heat the oven. You cut the veggies. While the veggies are being sauteed, break eggs and whisk it. Prepare the bread. Mix egg and vegetable mixture. Pour into the pan. And we are done, the rest of the work will be done in the oven. Isn’t it easy peasy. 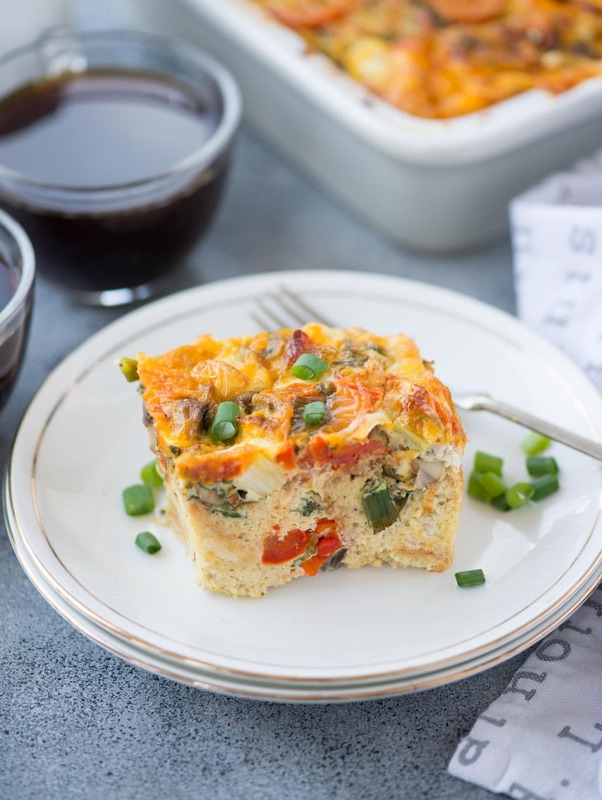 This breakfast casserole is very versatile. You can basically add any of your favourite veggies. I have added mushroom, peppers, tomatoes and Spinach in this recipe. You can add Zucchini, kale, sweet potatoes too. Bacon is a wonderful add on to this casserole too. 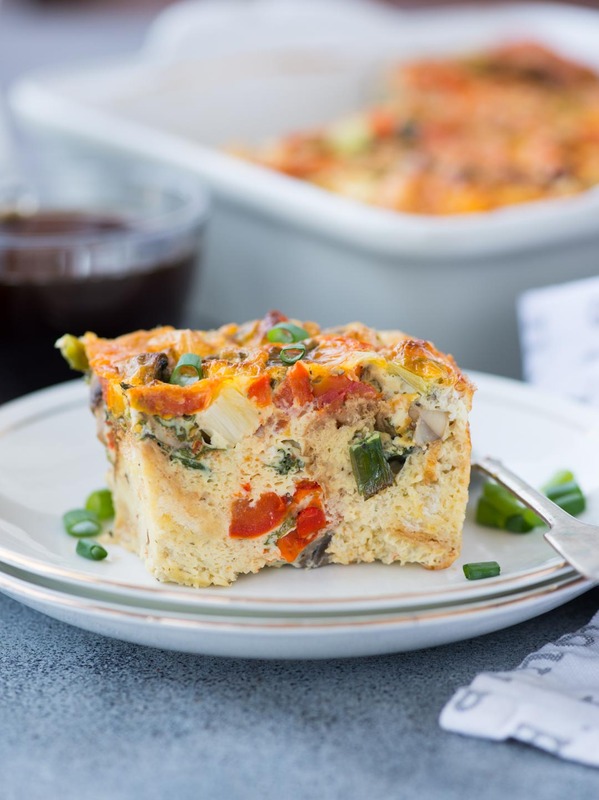 This Breakfast Casserole is a great way to use up those leftover veggies and bread. Though the prep takes only 10 minutes, you can also make this the night before and refrigerate. Next day morning you pop it in the oven. Making Breakfast casserole is really easy. It starts pre-heating the oven. While the oven is preheating, prepare the veggies. Break eggs and whisk with milk. Add cooled sauteed veggies. Arrange bread in the baking pan. Pour in egg mixture on the bread. Sprinkle cheese and bake. If making it ahead and baking the next day, then tightly cover the pan with aluminium foil. Next day before setting the oven to pre-heat, remove the pan. Uncover the pan and bake until done. It might take a little longer to bake in this case. HOW TO STORE BREAKFAST CASSEROLE? It tastes great when it is immediately out of the oven and still warm. But the leftovers can be stored up to 4 days in airtight containers in the refrigerator. So it is great for meal prepping.